The Conscious-City-Lab is an evolutionary space, which ponders the relationship between information and users as a dynamically steering environment. The result is, that the environment becomes an intelligent artifact. Conscious-City-Lab is a visionary public performance space and planning-support tool for city development. It is an environment where people can meet to learn about imagine and discuss the future of their city. The Conscious-City-Lab empowers experts and non-experts, citizens and decision-makers to work together closely on the complex aspects related to life our cities of tomorrow. CHORA conscious city successfully launched the first working prototype of the Conscious-City-Lab - a multi-media installation, learning environment and planning-support tool for Smart City Berlin, that encourages participation, dialogue, and knowledge dissemination - has been presented at the Metropolitan Solutions in May 2015 and at the Berlin Lange Nacht der Wissenschaften (Science Night) in June 2015. Designed for a general public interested in science and technology innovation, the program employed a range of artistic strategies such as performances, visualizations, and Scenario Games to give a glimpse on how smart, low-carbon cities could be planned in the future. 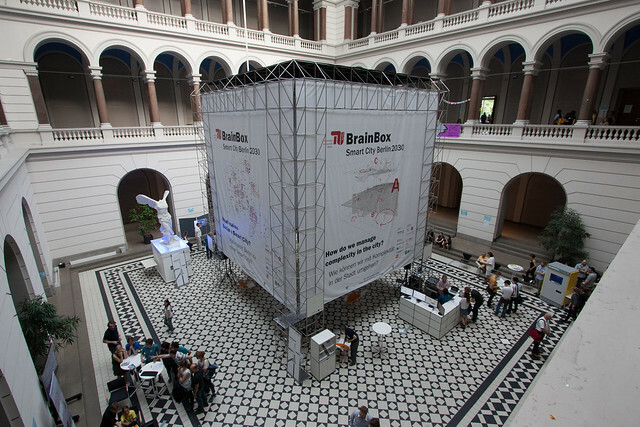 Conceived as a giant cube of ten meters height and accessible from all sides, the TU Conscious-City-Lab provides a temporary public space for smart city planning. With the help of an interactive table and game cards, experts could discover over 300 projects and aspects of Smart City Berlin. Conscious-City-Lab was also bringing together and presenting for the first time the whole breadth of smart city research at TU Berlin. Representatives of over 20 institutes took part touching on a variety of issues such as participation, big data, health, water, e-mobility, or smart grids.